We already know that in many areas old plans for cutbacks and hospital closures are being dusted off and rolled out as "new" Sustainability and Transformation Plans to make billions in cash "savings" while NHS funding is effectively frozen, and falling in real terms till 2020. We know that many of these plans, which are supposed to be implemented by in October, aim to override any accountability or consultation. They have set up new arrangements using delegated powers from trusts, CCGs and local authorities which put the decisions in the hands of a tiny handful of managers - with all of the emphasis from NHS England focused on delivering "savings" to wipe out huge trust deficits. As the full facts of the new structures are revealed, this approach could yet be tested by legal challenge. In some areas controversial plans have already been delayed, and in many areas there are clear divisions over implementation, with Tory MPs in many areas fearful of endorsing cutbacks, and the Tory party potentially split on these issues as well as the Brexit vote. We can make a difference by campaigning: but if there is no resistance, bad policies will be imposed by unaccountable bureaucrats - doing long-term, possibly permanent damage to our NHS. So we’re asking you to send us any information on local plans, cutbacks and privatisation of services in YOUR area to stpwatch@gmail.com. Get your local campaign or trade union organisation to join Health Campaigns Together. We are beginning to collate and publish resources, links and information so far on what STPs are, how they are supposed to work, and what local services could be at risk. We're watching for now, to capture all the information we can, but our aim is to prevent STPs from simply piling on cuts that undermine our NHS. Join us. Let's fight and win. As John Lister warned in his Touchstone blog [see below] NHS England and other NHS management bodies have ganged up to impose new organisational structures in which debt-ridden Trusts are being thrown together with CCGs, and required to 'collaborate' over cutbacks and new ways of working. 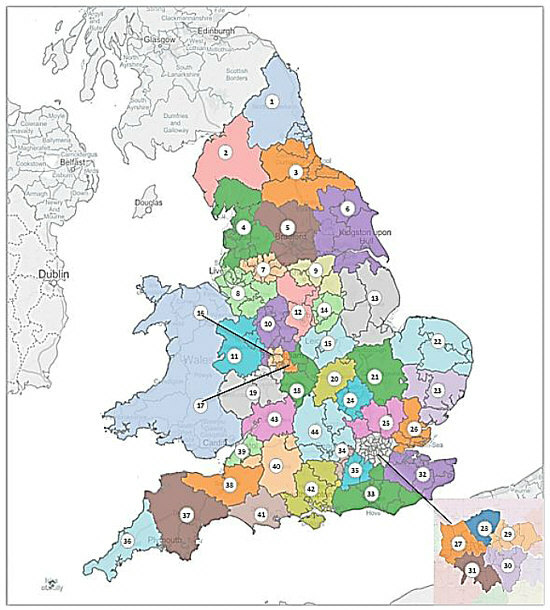 The new "footprint" areas have been agreed in a short timescale by local NHS managers - with no consultation whatever with local people and community organisations. Each Footprint is now required to work as a "local health economy," and to draw up a 1-year plan to restore financial balance, and a 5-Year "Sustainability and Transformation Plan" - by June this year! This is all designed to focus management attention on "reconfiguration" and "transformation" of services - to make massive financial cuts and balance the books in 2016-17. This comes amid mounting evidence that as a result of the financial squeeze 70% of the NHS priority programmes are at risk. The full map of the Footprints, with a list so you can find YOUR local Footprint is HERE. NHS Improvement boss Jim Mackey and NHS England chief executive Simon Stevens have both stressed that this new change is a strategic one, requiring commissioners and providers to collaborate. But while Lansley's Health & Social Care Act remains in force, the hugely expensive and wasteful apparatus of the purchaser-provider split remains. CCGs will still be required to put services out to tender - and there is still insufficient funding to deliver NHS services, with real terms increases from now to 2020 averaging a miserable 0.9% per year - before deficits are taken into account. Foundation and NHS trusts are now warning that their deficits are unlikely to be wiped out in 2016-17 - so the Footprints could be the cue for really drastic action. As Jeremy Hunt demands NHS trust managers clear deficits before they receive any of the £1.5 billion "transformation fund" in 2016-17, figures from a snap survey of trust board papers in early February by pressure group London Health Emergency show trust deficits are bigger than ever, with 138 out of 150 trusts in the red. The total deficits for England's 150 acute trusts are now more than a massive £2.2 billion. Just nine trusts were in surplus, sharing a meagre total of £11 million between them, while three have not published figures on their websites. 10 trusts each face deficits of more than £40 million, while three have shortfalls in excess of £70 million, headed by Barts Health, the biggest NHS trust in England, with the biggest debt at a monster £134 million. "The only way to get the NHS back on an even keel is for substantial increases in real terms funding, an end to the bureaucratic costs and fragmentation of the competitive contracting system imposed by Andrew Lansley's disastrous health and social care act, and urgent steps to regain the trust and confidence of junior doctors and other healthcare staff, beginning with a reversal of Jeremy Hunt's decision to impose his unsafe and unfair contract."